Thank you to Mezzetta for sponsoring today’s wonderful memories and recipe for sharing joy this holiday season. As a child, the olive plate and appetizers were one of my favorite parts of the holidays. I felt like I was at a fancy buffet as my eyes lit up with all of the beautifully arranged goodies on fancy dinner plates and serving platters that were only brought out once or twice a year. One of the reasons I was so drawn to them was the tiny foods looked like miniature meals I would feed a mouse and of course, I, like most children, loved to put olives on each of my fingers and eat them off one, by one. 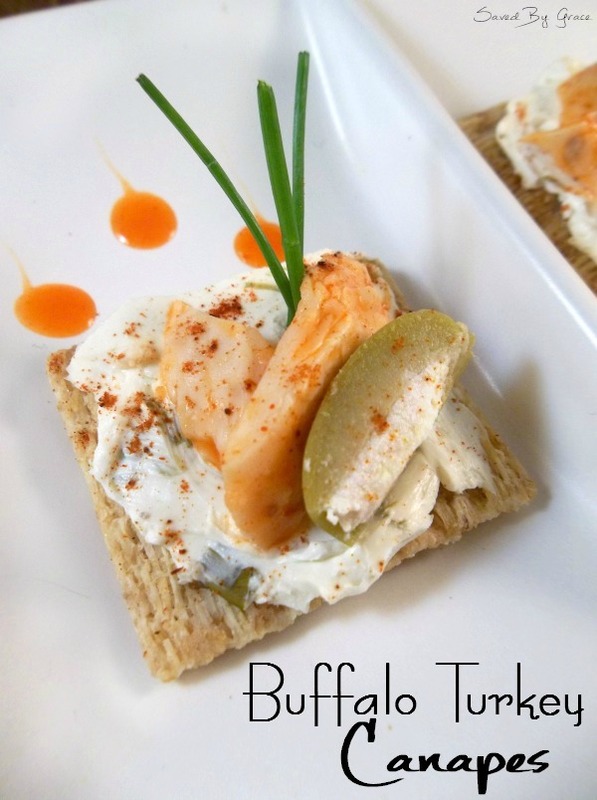 This amazing memory is one that inspired me to create these Buffalo Turkey Canapes. Well, that, and I had plenty of leftover turkey in my fridge and felt this would make great use of it as well as creating another delicious mini-meal to share joy with the folks I love. Mezzetta makes it easy to create inspiring holiday recipes, too. They are very simple to put together and would be a great way to make Mezzetta memories with your kids since they can help you assemble them with ease. A canape by it’s very nature is 4 parts; a base, a spread or sauce, a main component and garnish. I used two garnishes for this. One, some Mezzetta Olives and two, a sprig or two of fresh chives under the turkey. To make the turkey have it’s kick, just break it up into chucks and add about 2 tbsp of hot wing sauce per cup of turkey. Take a cracker of your choice. 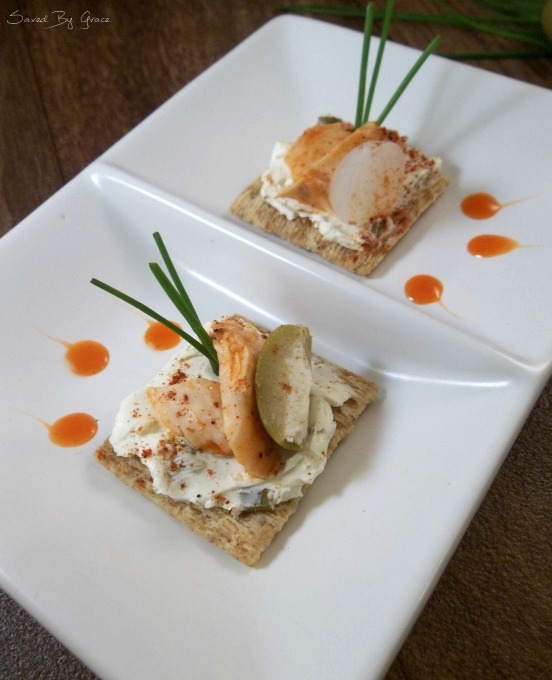 I used woven wheat crackers for their nuttiness and great texture as the base of my canape. Spread the cream cheese on it evenly. Top with criss-crossed sprigs of fresh chive. Add a bite sized amount of buffalo turkey. Top with a Mezzetta Blue Cheese stuffed green olive. You can either cut these in half or leave them whole. 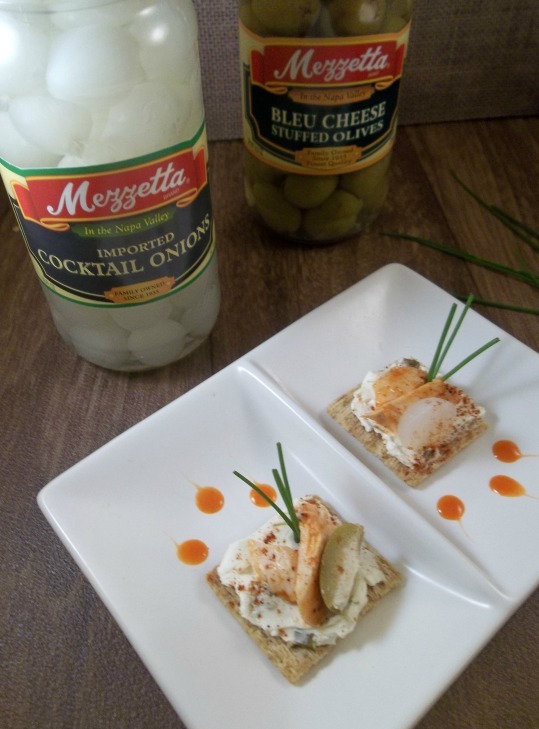 Alternatively, you can also use pearl onions from Mezzetta as well like I did here. Peirce each canape with a toothpick or small appetizer fork and serve. To help you create more memories of your own using Mezzetta products like I did, make sure you print of this 50 cent coupon to try your hand at creating something amazing for your holiday parties this season! It’s super easy to enter! Make sure you share your favorite holiday memories, too! Click the image below to get your 50 cent off coupon for awesome Mezzetta products and to enter the 31 days of giving giveaway! Spread the cream cheese on your cracker. My kids do that with the olives too! I don’t like olives, but I buy them just for the kids and my husband. This little appetizer looks so tasty! That looks so good! i love that the olives are stuffed with bleu cheese. Michelle F. recently posted..My Secret to Quick, Beautiful and Shiny Hair! + Curls! YUM! My whole family would love this recipe including my picky eater. What a great appetizer for a holiday party and a perfect way to use up that leftover turkey. Looks so pretty! Thank you very much, Alli! I’m flattered you think so! They’re plated so beautifully, and look fantastic. I think everything in the bite would be fabulous. This would make a perfect snack for a football party or a holiday party. Yeah, I hadn’t even considered the football party angle! Wow, this look so fancy! But so easy to make at the same time! Great for entertaining. These sound amazing! Beautiful photos! What a great recipe. I love that it completely alters it’s flavor of the turkey and offers a mediteranian influence. That looks delish! We love Mezzetta brand. They are my husband’s and my son’s favorite brand of jalapenos. Wow!! Such a fancy little recipe! I love the way it looks and I bet it tastes just as good! Those are just beautiful and they look so tasty too!